Year after year, the streets of Colorado Springs slowly deteriorate with continued use. Cracks start to appear, pot holes grow, and roadways begin to show the need for maintenance. Yet maintenance isn’t as easy as fixing the roads with the most potholes. Choices such as what roads we repair and when can determine the longevity of our roadways and how much money we can invest in them. The quality of a road ranges from brand new, to fair, to poor. You would think that most of our roadwork happens when roads are in poor condition, but the most effective type of construction happens when roads are still in fairly good condition. Roads designated as “poor” typically need total reconstruction, replacing entire sections of the roadway, which includes the asphalt, subgrade, concrete and utility infrastructure. This can be costly work that takes 12-18 months to complete. Luckily for Colorado Springs, only 8 percent of our roadways currently fall in to this category. We want to avoid the other 92 percent of roadways ­currently in good to fair condition from sliding into the “poor” category. If more roads become poor, more money and time must be spent on total reconstruction. To prevent this from happening, a majority of our construction efforts are allocated to preventative maintenance and paving. This type of work is both quick and cost effective, especially in comparison to total roadway reconstruction. Preventative maintenance includes work like crack sealing and chip sealing and is funded as part of a 1 percent sales tax from the Pikes Peak Rural Transportation Authority. Thirty-nine percent of roadways currently require preventative maintenance and repairs take an average of 1-7 days per road. Paving, on the other hand, is funded through the voter-approved 2015 Ballot Measure 2C and includes curb-to-curb paving for roadways, sidewalk, curb, and gutter maintenance. Fifty-three percent of roads qualify for 2C paving, and construction time generally takes 7-21 days per road. However, that doesn’t mean roads in the poor category are being ignored. 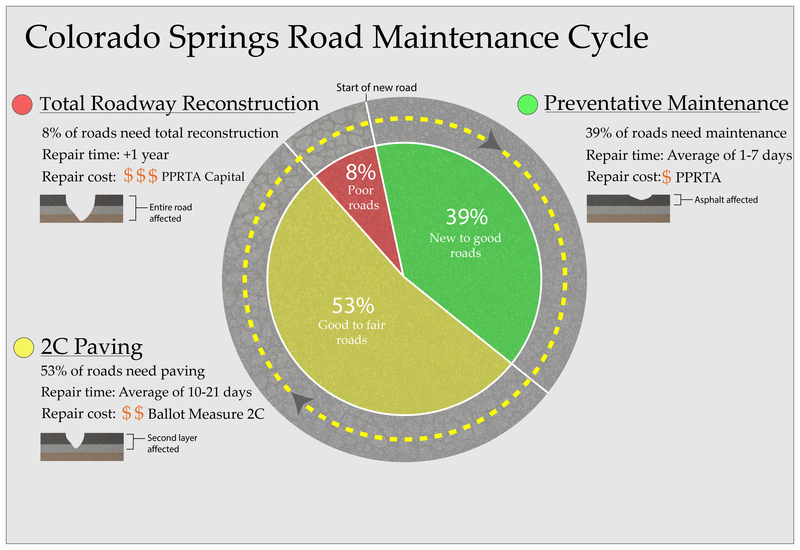 The 8 percent of roadways that need total reconstruction are receiving money from PPRTA funds dedicated to capital improvement. These projects operate alongside our other construction efforts to provide needed maintenance to our most deteriorated roadways.